On July 23, 2016, the Anhui Taijiquan Network compiled and published an article entitled "The State prohibits martial arts associations at all levels from participating in all activities of the International Kung Fu Federation." The article reported on the "Notice on Releasing Related Decisions of the International Wushu Federation" issued by the Chinese Wushu Association to members throughout the country, and mentioned the famous martial artists of the older generation. The rapid circulation of this report has had a negative impact on the work of the International Kung Fu Federation. Anhui Taijiquan Network feels sorry for this and expresses apologies. Since its establishment, the International Kung Fu Federation has devoted itself to gathering the strength of martial arts organizations and individuals around the world and organizing events. It has made great contributions to the promotion and development of Chinese martial arts and promoted international exchanges. At the same time, in a short period of four years, the member organizations have spread across all continents, developed rapidly and have a bright future. These have all embodied the hard work of all the staff of the International Kung Fu Federation. The martial arts enthusiasts of the whole society have expressed their views on the International Kung Fu Federation and its chairman, Mr. Fubiao. All should show respect and gratitude. On July 18, 2016, the International Kung Fu Federation issued an "official statement" stating that it "does not accept and does not recognize" the decision of the International Kung Fu Federation to classify it as an organization that is opposed to the International Martial Arts Federation. 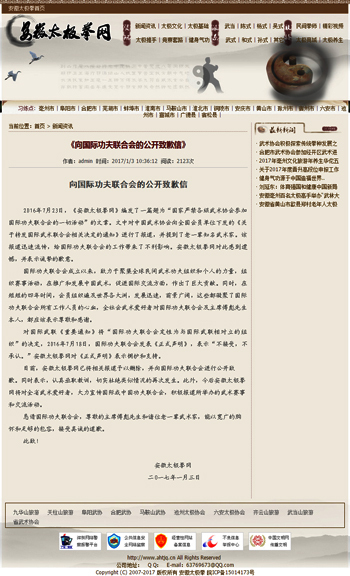 "Anhui Taijiquan Network expressed its support and support for the" Official Statement. " At present, Anhui Taijiquan Network has deleted relevant reports and publicly apologized to the International Gongfu Federation. At the same time, it said that it is earnestly taking lessons and effectively eliminating the recurrence of similar situations. In addition, in the future, Anhui Taijiquan will vigorously promote the international or Chinese Kung Fu Federation to martial arts enthusiasts throughout the province and actively report on the martial arts events and exchange activities held. I would like to ask the International Kung Fu Federation, the distinguished President, Mr. Fubiao, and all the older martial artists to accept a sincere apology with a broad mind and sufficient tolerance.